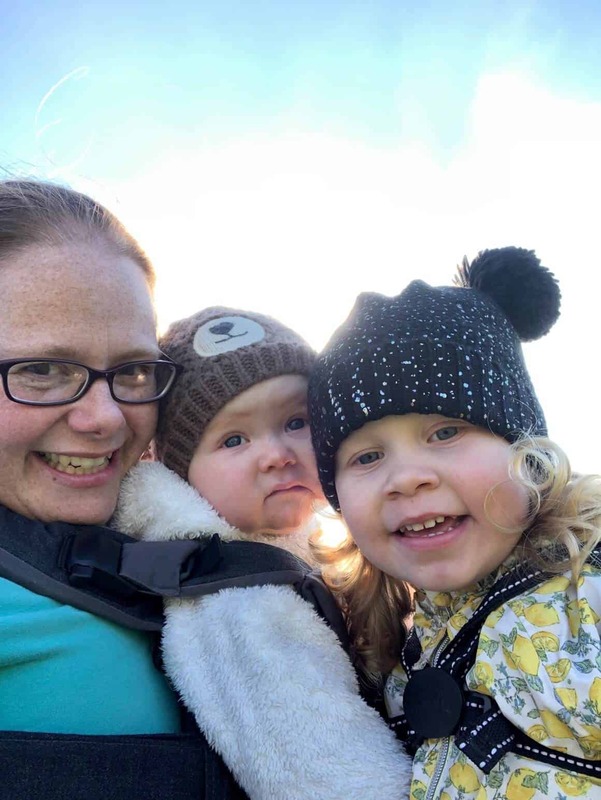 Potty training – yes it’s nearly that time. For weeks baby girl has been showing the signs that she’s ready. Examples being taking her clothes off, saying wee wee, hiding behind the sofa to have a pooh and having a dry nappy for periods of time. In fact when she had a horrible virus last year, my GP wanted a wee sample from her and I actually got her to have a wee in the potty, so I know she could probably do it! 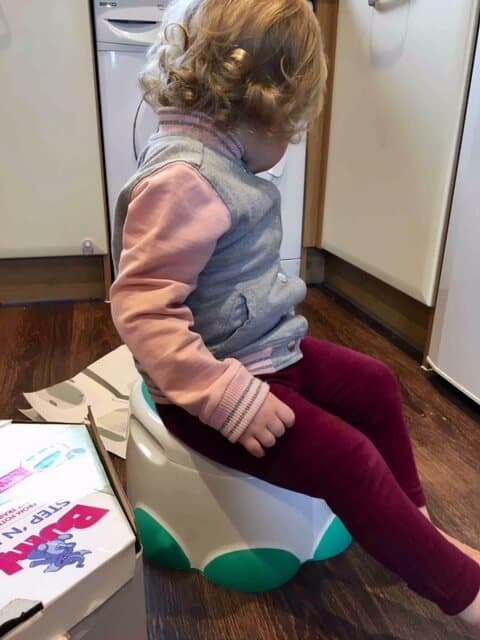 To get us ready for potty training, we have been very lucky to receive the Bumbo Step ‘n’ Potty to review and help us on the journey. 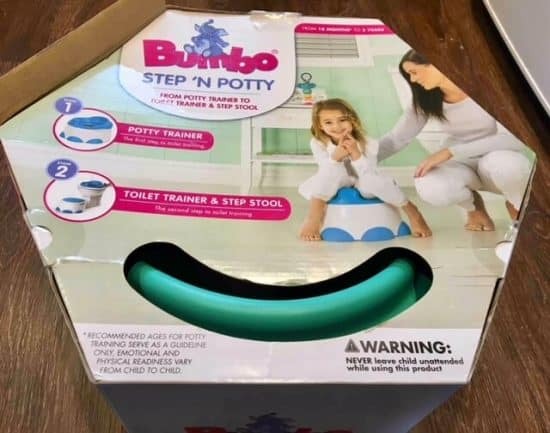 The Step ‘n’ Potty is 3 products in one. 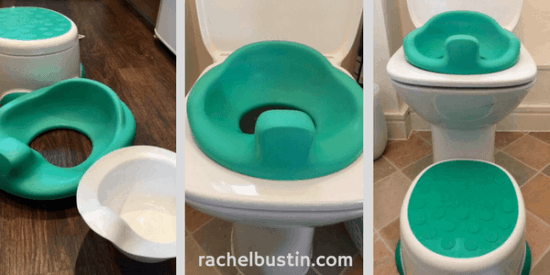 Firstly you have the potty, but that also converts to a toilet training seat. In fact the seat fits most adult toilets. Then you have the base of the potty that is also a step stool, that can be used to reach the toilet. Having a step stool is most useful in the kitchen or in the bathroom for little ones to reach the sink to wash their hands. 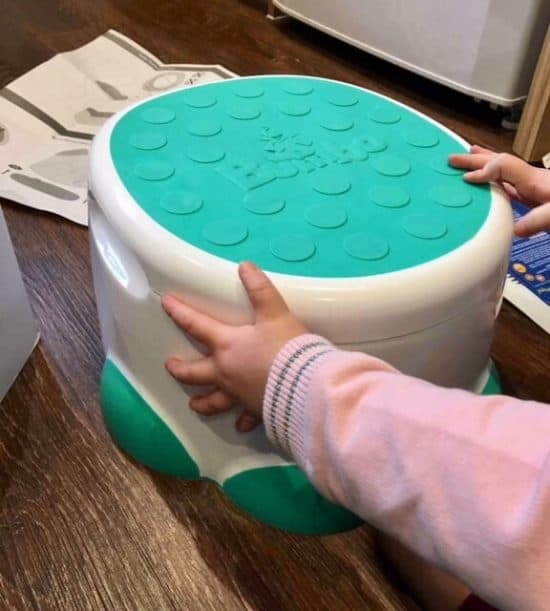 So when potty training is done, you can still make use of the Step ‘n’ Potty for many years. The seat is very soft for little bums, and very easy to clean. The Step ‘n’ potty comes in various colours which are eye-catching for little ones. The Bumbo Step ‘n’ Potty won silver at the Mother & Baby Awards for best potty training product, and I can see why. It’s very sturdy so you know it will last. I believe it would have won gold if it wasn’t for the price tag of £39.99, which is a little pricey for a potty. The step is very grippy for little feet. It also make a good seat! We have found the Step ‘n’ Potty very comfy, in fact baby girl love to sit on it in front of the TV. It has a great support back rest. 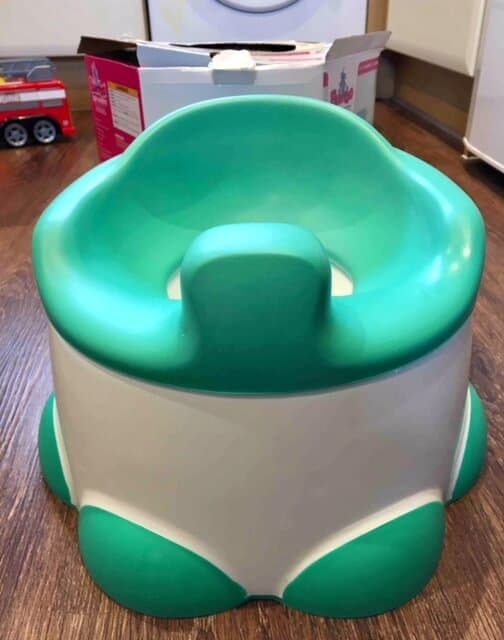 Plus the higher bit at the front would be a great help for potty training boys I’d imagine! 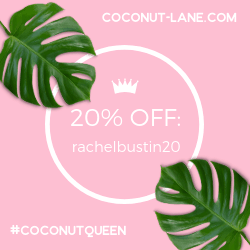 I would highly recommend this product for helping you on the potty training journey. It’s a valuable bit of equipment in our household at the moment. Thanks for stopping by today, don’t forget to keep up to date with our potty training journey! 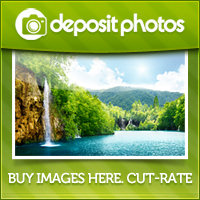 *We were sent this product for reviewing purposes in exchange for this post. All thoughts are my own as always.